I also went with a tart shell instead of a pie crust because I find they are a little less fussy and easier to put together in a hurry. Since my tall man also prefers a crunchy cookie crust this swap was even better for him. The added pecans gave it beautiful flavor and color, too. This tart is adaptable- add blueberries instead for my dad, a chocolate crust instead for my best friend, or even chocolate pastry cream. It's easy and flexible- which is what makes it a family favorite. And I'll be honest. I make one of these every month or two (that's often since I'm trying so many new desserts) and every time I'm whisked back to Paris. That alone makes this a family favorite. Line baked and cooled tart shell with the pastry cream, spreading evenly over the bottom of the shell. Arrange the strawberries in a pattern, squeezing in tightly. Heat strawberry jam until warm and spreadable in the microwave or a small saucepan. Brush over strawberries to create a shiny topping. Slice and sprinkle each piece with a little powdered sugar (using a sieve) and serve. Put the flour, nuts, sugar, and salt in a food processor and pulse a couple of times to combine. Scatter the pieces of butter over the dry ingredients and pulse until the butter is coarsely cut in- you should have some pieces the size of oatmeal fakes and others the size of peas. Stir the yolk, just to break it up, and add it a little at a time, pulsing after each addition. When the egg is in, process in long pulses- about 10 seconds each- until the dough, which will look granular soon after the egg is added, forms clumps and curds. Just before you reach this stage, the sound of the machine working the dough will change- heads up. Turn the dough out onto a work surface and, very lightly and sparingly, knead the dough just to incorporate and dry ingredients that might have escaped mixing. 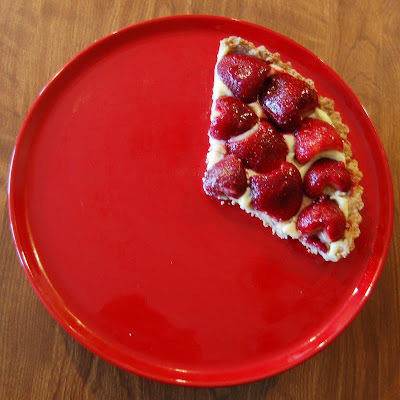 To press the dough into the pan: butter a 9-inch fluted tart pan with a removable bottom. Press the dough evenly over the bottom and up the sides of the pan, using all but one little piece of dough, which you should save in the refrigerator to patch any cracks after the crust is baked. Don’t be too heavy handed- press the crust in so that the edges of the pieces cling to one another, but not so hard that the crust loses its crumbly texture. Freeze the crust for at least 30 minutes, preferable longer, before baking. To partially or fully bake the crust: center a rack in the center of the oven and preheat to 375 degrees F.
Butter the shiny side of aluminum foil and fit the foil, buttered side down, against the crust. (since you froze it, you can bake it without weights). Put the tart pan on a baking sheet and bake the crust for 25 minutes. Carefully remove the foil. If the crust has puffed, carefully press it down with the back of a spoon. For partially baked crust, patch the crust if necessary, then transfer the crust to a cooling rack. To fully bake the crust, bake for another 8 minutes or so, or until it is firm and golden brown. Transfer pan to a rack and cool the crust to room temperature before filling. Meanwhile, in a medium heavy-bottomed saucepan, whisk the egg yolks together with the sugar and cornstarch until thick and well blended. Still whisking, drizzle in about 1/4 cup of the hot milk-- this will temper, or warm, the yolks so they won't curdle. Whisking all the while, slowly pour in the remainder of the milk. Put the pan over medium heat and, whisking vigorously, constantly and thoroughly (making sure to get the edges of the pot), bring the mixture to a boil. Keep at a boil, still whisking, for 1 to 2 minutes, then remove the pan from the heat. Whisk in the vanilla extract. Let sit for 5 minutes, then whisk in the bits of butter, stirring until they are full incorporated and the pastry cream is smooth and silky. Scrape the cream into a bowl. You can press a piece of plastic wrap against the surface of the cream to create an airtight seal and refrigerate the pastry cream until cold or, if you want to cool it quickly--as I always do--put the bowl into a larger bowl filled with ice cubes and cold water, and stir the pastry cream occasionally until it is thoroughly chilled, about 20 minutes. Ms. 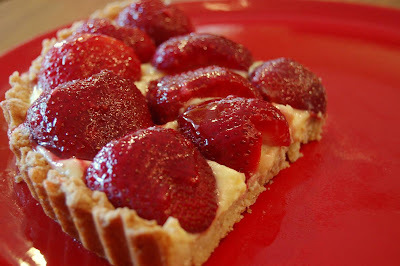 Strawberry (fun story), what a great looking tart! And I love your new photo of yourself! No wonder I like you ! My baby sister was ALWAYS ANNIE BANNANNIE ! She's 30 now, and I still think of her as Annie Bannannie !!!!!!!!!!! Love the new photo. Your tart looks amazing and delicious. This looks so delicious and sounds so versatile. What a lucky family you have -- making all their desired favorite variations! :)Love it! I can see why this is a family favorite. It looks wonderful. So much simpler than a lot of the Strawberry pies out there. Great job. Very pretty. i will be at the reunino too obviously! Holly Dolly here Ms. Anne Strawberry. :) I would have happily had a piece of this pie. It looks fantastic. BTW I haven't openly admited to my Dad's nickname for me in years, so I guess you inspired me. Ooooh, yummy! I accidently made a similar tart once and fell in love with it. So delish! GREAT looking pie/tart. Love the personal story, too! Another awesome pie, Mrs. Strawberry! And you and your family sound happy and appreciative of one another. What a great family story. I love strawberries too! This is a great recipe because it can be adapted in so many ways - love it! Thanks for sharing! It's the perfect springtime treat. Gorgeous! A tart after my own heart! Good story too; perfect inspiration. Anne - this looks wonderful! I have yet to make pastry cream - but well, I think you just inspired me! LOVE this! I think I'm going to have to make after we go strawberry picking this year! looks great! and definitely versatile enough to make some version of every week without getting sick of it. Anne, I loved learning the origin of your nickname - so fun!! Your tart is beautiful! I love how versatile it is - like you said, a perfect way to make everyone happy! Yum! I keep thinking I should joint Pies with That. I know I'd love it (er... The Husband would love it). I always wondered where the Strawberry came from... LOVE IT! I love your new picture! And I'm thrilled to finally learn the reason behind the name of you blog!